Big Rainbow Tomato | Henry Field's Seed & Nursery Co. Stunning shades of gold to scarlet and everything in between make this heirloom variety truly stand out. 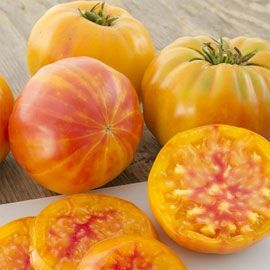 Giant fruits, up to 2 pounds, have a rich balance of acids and sugars that gives it a true old-fashioned tomato taste. Resistant to foliar disease and cracks. Indeterminate. 90 DAYS. 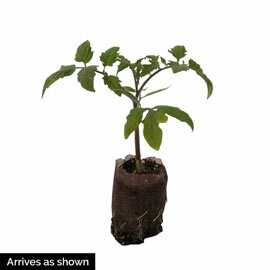 Form: Vining.Indeterminate (will grow and produce fruit until frost. These plants should be supported by stakes or tomato cages). Fruit: Stunning shades of gold to scarlet and everything in between. Giant fruits up to 2 lbs. have a rich balance of acids and sugars giving it a true old-fashioned taste.